The Digital Futures Discovery Series kicked off its 2018 schedule on Feb. 7 with a presentation on digital datasets and Virtual Reality in an ongoing cultural heritage project. The talk and interactive demonstration, titled “MorgantinaVR: Visualizing Material Culture in Virtual and Augmented Reality,” was led by Alex Walthall, assistant professor of Classics at the University of Texas–Austin and director of the American Excavations at Morgantina: Contrada Agnese Project (CAP), and by Luke Hollis, founder and developer at Archimedes Digital. 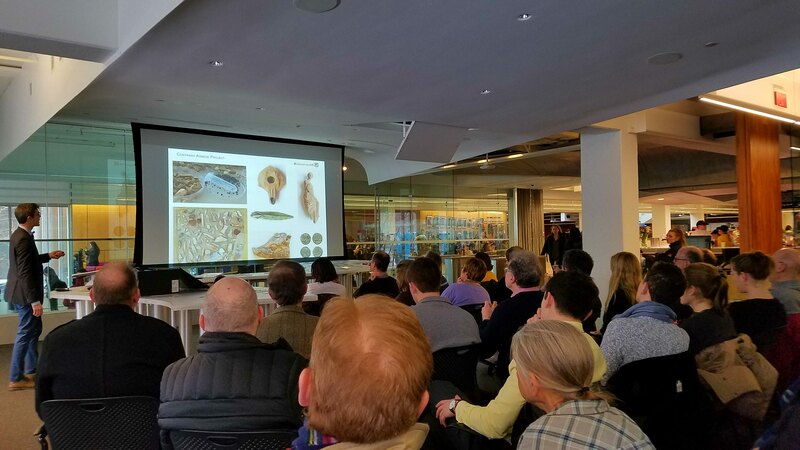 Presenting to a standing-room-only crowd at the Cabot Science Library’s Discovery Bar, Walthall and Hollis provided an overview of the excavations at the ancient Greek site of Morgantina (Sicily), the goals of the current excavations, the digital architecture and interactivity that underlies the project, and the development of the VR environment in the Unity gaming engine. 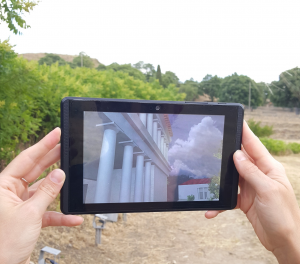 Alongside the systematic excavation, conservation, and analysis that make up the core of the Morgantina excavation, Archimedes Digital and CAP have partnered to perform truly groundbreaking digital work. Utilizing a comprehensive collections database (the Morgantina Legacy Data Project), Archimedes joined GIS data with museum records and 3D photogrammetry to visualize the excavation trenches and material finds, while also developing 3D simulations of the site’s ancient buildings for use in an immersive Virtual Reality experience. Following the talk, visitors were able to don a Vive headset next to the Discovery Bar and explore the 3D simulations for themselves. 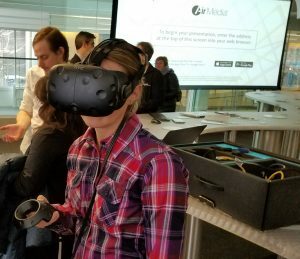 The immersive experience drew an overwhelmingly positive reaction, with several attendees staying after the event’s conclusion to ask questions and to experience the VR environment a second time. 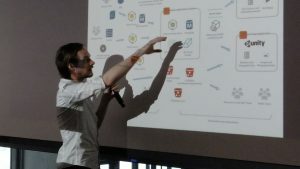 The Digital Futures Discovery Series is a collaboration between the Digital Futures Consortium at Harvard and the Harvard Library. Presentations take place at the Cabot Library Discovery Bar on the first Wednesday of each month during the academic year. For more information on the Digital Futures Consortium, visit digitalfuturesconsortium.org. For more information on the American Excavations at Morgantina: Contrada Agnese Project, visit themagazzino.org.